Cleaning Equipment Supplies. One of the largest ranges of high quality cleaning equipment in the UK. Vacuum cleaners, carpet and upholstery cleaners, carpet dryers, high pressure cleaners, foamers, forecourt vacuum cleaners, forecourt high pressure washers, brake disc and lining cleaners, steam cleaners, sweepers, window cleaning equipment, floor scrubbers, floor scrubber polishers, floor polishers, floor pads, scrubber driers, escalator and stair cleaners, snow blowers. Whatever you need - it's right here - at our best possible price. We supply vacuum cleaners throughout the UK for every conceivable task. From a range of powerful lightweight domestic vacs for use in the home. Produced by Numatic, Karcher and Sealey, the same manufacturers who make our commercial and industrial vacs, to every type of commercial and industrial vac available. We have a vast range of commercial and industrial vacuum cleaners in both dry and wet/dry options. Hazardous dust vacs, air driven vacs, battery operated vacs, pond cleaning vacs and forecourt vacs are all included in the choice we offer for sale. Mostly based around the traditional and well-proven spray extraction method of cleaning carpets and upholstery where the cleaning solution is sprayed onto the fabric then immediately extracted with a powerful vacuum, removing both solution and engrained dirt. 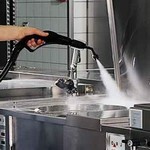 Spray extraction is still the preferred method of cleaning by most professionals. Choose from a range of wand operated or automatic carpet cleaners. Carpet Dryers and Turbo Blowers. Designed for the quick drying of carpets after floods or wetting with spray extraction machines. These powerful turbo carpet dryers are also capable of fast drying varnish, floor polish and newly painted surfaces as well as ventilating large areas and smoke removal. Commercial and industrial high pressure washers are still by far the best method of vehicle cleaning and outdoor cleaning, walls, patios, pavements, equipment, trailers, caravans etc to name but a few. We have a range of Sealey and Karcher high pressure washers for sale. 2. Hot water and steam cleaners for engine, chassis cleaning and heavy plant cleaning. We offer a choice of power sources including single phase electrics, three phase electrics, petrol and diesel driven. Also coin operated forecourt pressure washers. Foam applicators for fast and economical cleaning of factory surfaces and large surface areas such as aircraft, boats, caravans and car cleaning. A choice from a range of Karcher forecourt vacuum cleaners and Karcher forecourt high pressure washers for car and truck cleaning. Also known as dry steam cleaners or superheated steam cleaners for floors, carpets and ovens. There is nothing to beat them for most cleaning tasks such as degreasing kitchens and kitchen equipment, wheelie bins, bathrooms, toilet cleaning and stain removal from fabrics and all sorts of hard surfaces. We have a choice of domestic steam cleaners for home use, commercial steam cleaners for kitchens and restaurants, industrial steam cleaners for food factories and medical steam cleaners for hospitals. Sweepers for sale. From indoor carpet and hard floor sweepers to road sweepers and street cleaners plus everything in between. Our sweepers allow you to lift dust, debris, leaves and litter effortlessly. Choose from walk-behind pedestrian operated to battery, petrol, diesel or LPG driven models. No more ladders, no more chamois leathers. Clean windows up to 50 feet from the ground with both feet planted safely on terra firma. These residential, commercial and professional window cleaning kits produce ionised water which doesn't leave smears or run marks. Also ideal for cleaning high sided vehicles, curtainsiders, caravans, boats, buses and metal or plastic cladding. Escalator and Stair Cleaning Equipment. Escalators are probably one of the most difficult surfaces to clean because of the fluted design which traps dirt easily, these specialist escalator cleaning machines tackle the job effortlessly. Large scrubbing machines are usually too big and too heavy to operate on staircases, however this problem is solved by using our hand held scrubbing machines. Our Snow Throwers as they are sometimes known take away the massive physical effort required to clear paths and roadways of deep snow. These petrol driven snow blowing machines are capable of throwing snow up to 15 metres away. Even the incredible Manplow makes the task of snow clearing an awful lot quicker and easier.